Tuffy says: Azuls San Pep is Breeding Stock. 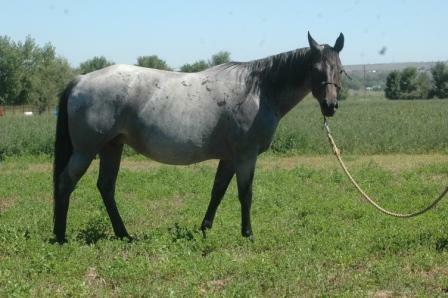 This filly is, in blood, a full sister to AZULS SAN PEPPY (see horses sold). She is going to be one of those drop dead beauties that will ride the best then be a top notch broodmare. She is a very sweet, quick learning filly that is really fun to be around. We are going to keep her for a replacement mare. She is pictured here with Aledocs Best, a red roan colt that would be this fillies 2nd cousin.